We are at the beginning of a new season, bringing colder weather and more colds and flu, especially among children. This article today offers you a way to protect yourself and your family during this time period, and to quickly boost your immune system. 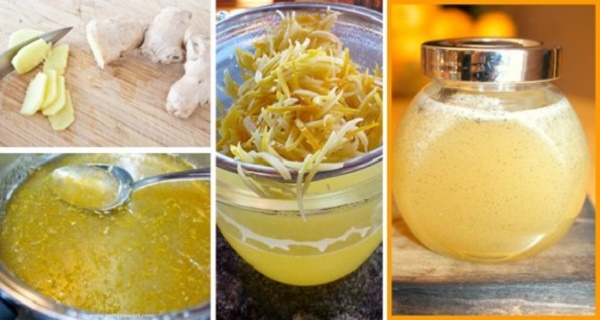 This ginger- infused honey remedy effectively fights against colds and flu, and at the same time, it is wonderfully soothing for your throat, has delicious taste, tastes delicious, and has some great leftovers. Moreover, it also serves in just about every East Asian inspired recipe that calls for a touch of sweetness. One of its ingredients, ginger, is a powerful antioxidant, being a fantastic cure for most problems with arthritis. It cures nausea in pregnancy, and protects against colorectal cancer. In addition, it’s a miraculous treatment for all motion sickness (air, land, or sea). Honey, on the other hand, contains extremely powerful antibacterial properties. It also possesses soothing qualities for sore, itchy or scratchy throats. Honey is loaded with antioxidants which help fight both aging and Alzheimer’s. The consumption of honey 30 minutes before bed reduces night time coughing. Another benefit of honey is that it stimulates serotonin which the body converts into melatonin, and it helps you sleep. Furthermore, it can alleviate mild allergy symptoms and build up tolerance to pollen. This is due to the fact that it contains trace amounts of pollen, which can encourage the body to produce antibodies to the pollen. That decreases the amount of histamine your body produces, which eventually lessens your allergies. Place the honey in the top of the double boiler with water at the bottom. Peel and slice the ginger into very thin slices, and add it to the honey. You can also choose to shred it. Bring the water to a boil and monitor the honey with the candy thermometer. Bring it to 185° and keep it at that heat for 10 minutes. Afterwards, remove from heat and let it stand for another ten minutes. After those ten minutes, strain out the ginger and pour it into the sterilized containers. If you chose to thinly slice your ginger, keep the ginger – it’s honey-glazed ginger and it’s great for your upset tummy. You can leave a bit of honey with the sliced ginger root, because it preserves the ginger. So, the longer you keep it with the ginger the more infused the ginger becomes – and the tastier it is. If you have shredded the ginger, you can also keep it, for it can be used in other recipes like stir fry, quick breads and the like.